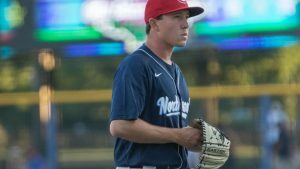 Right-handed pitcher William Ouellette had a breakout year in 2017. Ouellette’s big year began in Florida with the Dunedin Blue Jays, before heading to Vancouver. Allowing just one earned run in 6 1/3 innings pitched in the FSL was a great measuring stick for Ouellette, who will be looking to make more appearances there in the future. Limiting mistakes was something Ouellette did very well in 2017, as the righty maintained an impressive 1.00 WHIP, and picked up 13 saves in Vancouver. While he enjoyed every save he picked up last season, none was bigger than finishing up the C’s Championship run. What makes Ouellette’s season even more impressive is the fact that pitching is still relatively new to him. Performing primarily as a shortstop in college, Ouellette began the transition from field to mound in his senior year. Despite the limited time on the mound, Ouellette has already developed three pitches he uses regularly. Currently using a mix of a fastball, slider, and changeup; it appears that the righty is on the right track moving forward. Hoping to develop his game enough to reach the big leagues one day, Ouellette has visions of being like his father, Phil. Blue Jays fans hope William Ouellette can reach his dream, as a member of their organization.